Managed Network Security appliance installation. The Managed Network Security service includes an appliance for onsite installation. If you need assistance, please coordinate and schedule an installation with a tech support engineer by contacting TDS Support to schedule a 30 minute time period. It is best to include pictures, front and back, of your local components; ISP modem, Wi-Fi router, etc. Installation is surprisingly simple. Many customers accomplish the installation themselves. Be sure to notify us when complete so we can "optimize" your connection. The optimization process cleans the connection and assigns traffic lanes for prioritization and enhanced performance. Following, are the general installation instructions and guidelines for your reference. ISP modem - this is the cable or other internet provider you use. 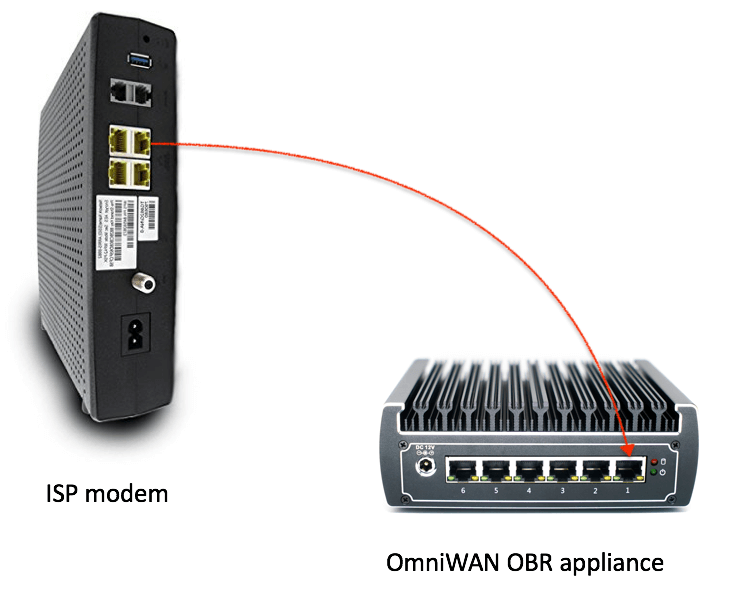 OmniWAN OBR security appliance - connects to the security center. WiFi router - your devices connect to the internet through your router. To follow the directions easily, it can be helpful to place each component left-to-right, as pictured above. Is the internet signal from your ISP consistent and reliable? Do you have internet outages? For best results, contact your provider to check and optimize your internet connection before installation. Is the signal consistent and reliable? Can you reach all areas without too much signal loss? Have your Wi-Fi router console credentials available - for signing in to adjust settings and controls for the router. *** Not all routers require this step, including AmpliFi-HD, eero, and Google models. Check your WiFi router's manufacturer online for the login information and default admin name and password. The following example is for a Netgear router, but the instructions apply across router types. The image below is an example of the "NETGEAR genie" WiFi router in ADVANCED > Advanced Setup > Wireless Access Point. The following example is for an Asus router, but the instructions apply across router types. Connect the appliance according to the general instructions and illustrations below. Custom installations may require additional configuration. 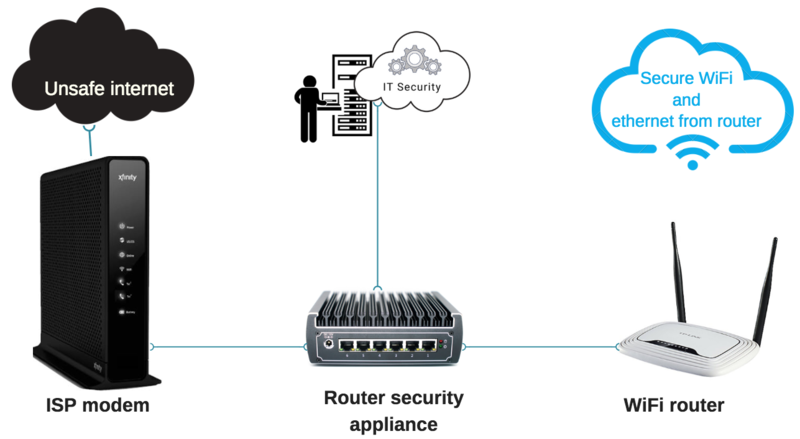 Place the security appliance where it can reach the ISP modem and the WiFi router using LAN ethernet cables. 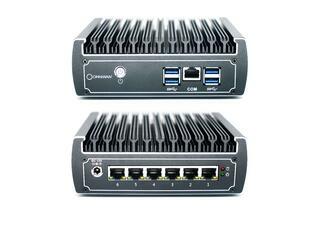 Plug in the OmniWAN security appliance to an outlet for power and give it a few minutes to start up. Connect an outbound ethernet cable from the ISP modem to port 1 on the back of your OmniWAN appliance. Image - connecting the ISP modem to port 1 of the security appliance. 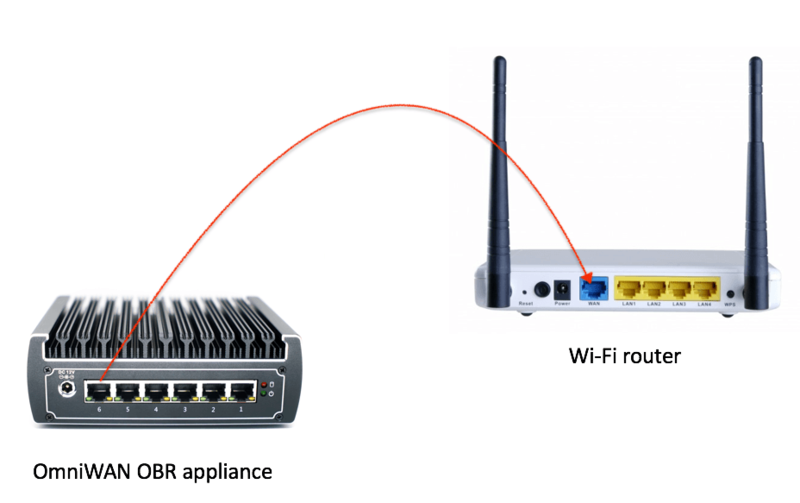 Now, connect an ethernet cable out of the OmniWAN appliance port 6, and the in-port on your Wi-Fi modem. Image - port 6 connects to the Wi-Fi router in-port. Do not use any of the other ports or inputs - they are for specific upgrade configurations and are not usable unless activated. Give the procedure plenty of time to propagate across the components. It is not unusual to take more than a few minutes before the components "shake hands" and the network is up and operational again. Check your Wi-Fi connection to the internet. Do not run bandwidth speed tests at this time. Email support@totaldigitalsecurity.com with customer name and the serial# on the appliance. We will "optimize" your connection for performance - this process will temporarily disrupt your network for about 10 - 15 minutes. You will be notified when optimization is complete. *** Note - if you use our Device Protection service by F-Secure, the Test will be blocked. You can clear the test by follow FAQ #5, here. Wi-Fi and LAN connections from your WiFi router are now secure. If you use our Device Protection service on your computer, it will block the Test because the simulation is mimicking malicious activity. You can work-around this with a simple procedure found in FAQs - "ShieldTest is blocked, what should I do?" Click to go back to Router Network Security Support. Click to go to the Home page.